This is a December scene from Waimea on Oahu's north shore. The spectacular surf is tinged a rosy color by the beautiful sunset. I love how the clouds seem to glow in this piece. This painting is sold. 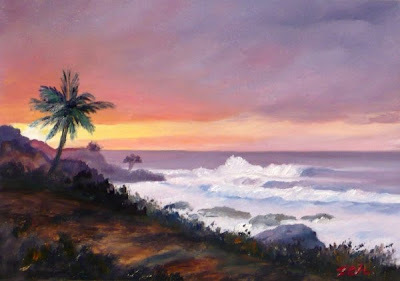 You can find my tropical paintings for sale in my Original Art Shop. Thanks and have a lovely day.